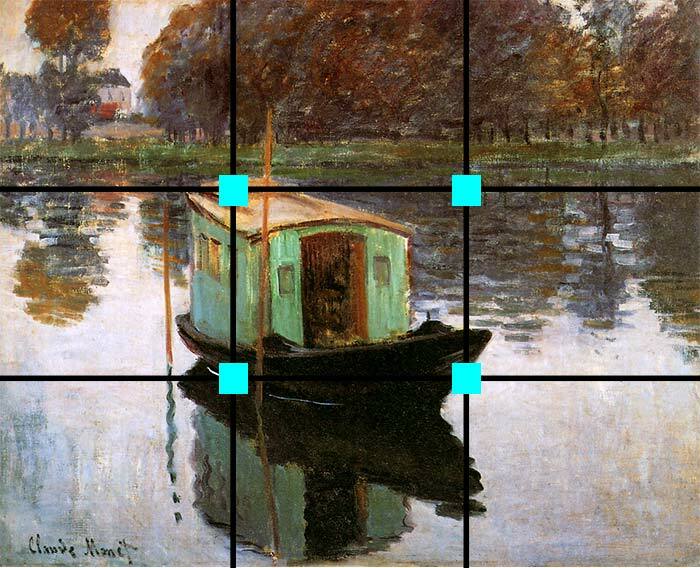 The rule of thirds is an important composition technique which can be used to improve the balance and structure of your artworks. It is a simple technique which you can use in all your paintings as a general guideline. However, please do not be bound by the technique. It is perfectly acceptable to break this 'rule' if it allows you to create a more intriguing painting. But generally, you will want to comply with this rule. What it entails is cutting your reference into thirds both ways using two horizontal lines across and two vertical lines down. You will end up with nine sections. These sections provide a powerful insight into whether your composition is effective or if changes should be made. First, you are provided with four intersections where the lines meet. These are highlighted in blue below. These are very important intersections as they are the generally preferred areas to place your focal point. This is because these areas are slightly off-center but also not on the edges of your painting. If you place your focal point in the center of your painting you run the risk of creating an unnatural composition. If you place your focal point on the edge of your painting, then you run the risk of directing the viewer out of your painting, rather than through it. Your painting would also not appear balanced. Second, you should try to ensure each section is unique to some extent. If you have two or more sections which appear very similar, then your composition may appear bland. Here are some examples of the rule of thirds in action. In the painting above by Claude Monet the obvious focal point is the boat, which is situated slightly off-center. Note how the edge of the boat is sitting on three intersections. Also note how all the sections are unique in some way. In the painting above by Vincent van Gogh, the main focal point appears to be the boats on our left. Note how these boats are placed at the bottom left intersection. 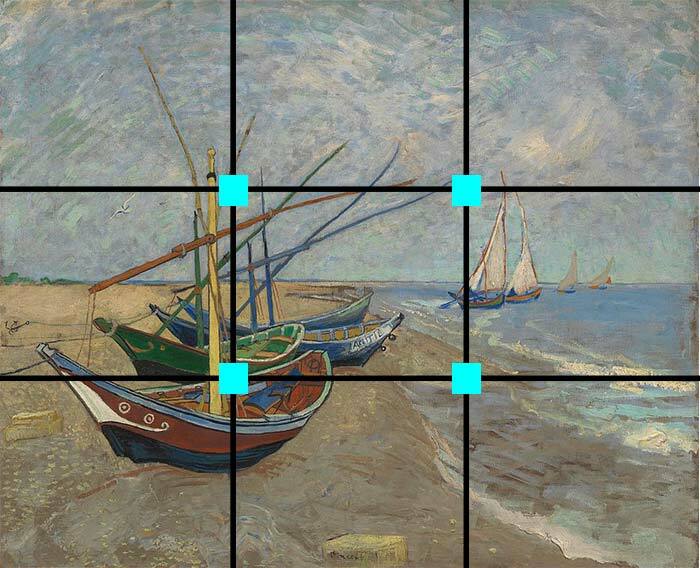 In relation to variance, the top segments appear fairly similar, however observe how Vincent van Gogh uses directional brushwork to create some level of variance. The painting above is a great example of the rule of thirds by Rembrandt (read more about the painting here). 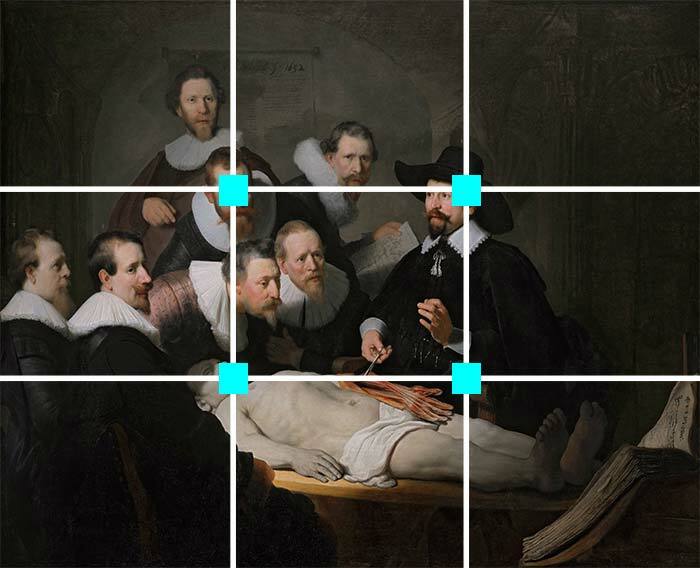 All of the subjects in the painting appear to be situated around the intersections in the middle, however there is not much going on directly in the center. Take note of where each of the intersections are and the importance of those areas in the painting. When To Break The Rule Of Thirds? Rules are made to be broken and the rule of thirds is no exception. The rule of thirds merely provides you with a guideline for improving your compositions. 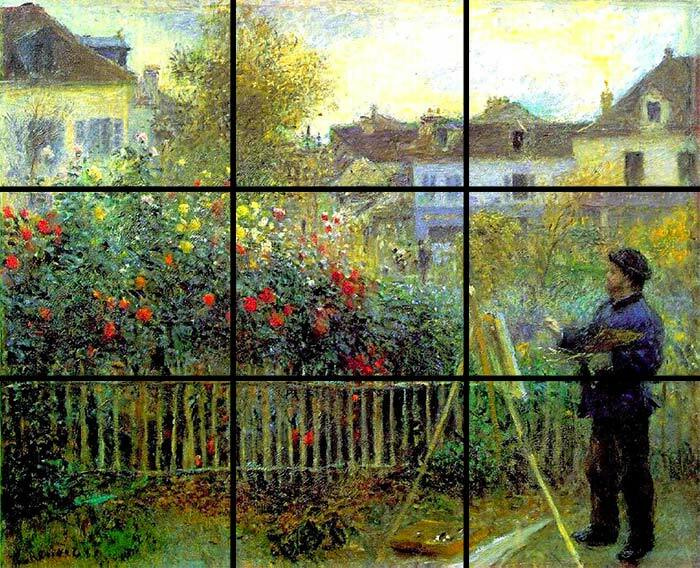 However you can still create stunning artworks when breaking the rule of thirds. For example, your focal point may not rest directly on one of the intersections, but it may just work better that way in terms of your overall composition. Or maybe you have two sections which have very little variance, but it is fine because you balanced it with the rest of your artwork. The point is, do not be bound by the rule of thirds. Use it to compliment you and learn when to use and not to use it. There are many famous paintings which break the rule of thirds and you would not even realise. If I am painting from a photo, then I will often use editing software (I strongly recommend Photoshop - affiliate link) to apply the two horizontal and vertical lines to the reference photo. I will then be able to analyze my reference photo in terms of the rule of thirds to see if my focal point is positioned appropriately and that there is sufficient variance throughout the composition (enough variance between segments). I also sometimes do this with photos of my finished paintings if I sense something did not work out as I had planned. You can also use these grid lines on your reference photo to help draw / paint with more accuracy. To do this, you can segment your paper / canvas into the same 9 sections and then aim to match those sections to your reference. I hope this post shows you the importance of the rule of thirds and how you can use it to improve your overall compositions. If you have any comments or questions, please share them in the comment section below. Does this rule applies for all subjects viz still life, portraits ? Yes the rule can be applied to all subjects including still lifes and portraits. Thank you Dan, this clears up my questions of why people use a grid. I had wondered why besides segmenting a photo. Appreciate it. No problem Kathy glad it helped! This is probably the best example of using the rule of thirds ever. The visuals are extremely helpful and make the concept easy to understand and apply. Thank you. Thanks for the very kind words Kathleen! I’m so happy I found you! Thank you for sharing your talent! I am always wanting to improve my work an I’m so happy I found you! I Love that you used Fishing Boats at the Beach at Les Saint Marie de-la-mer by Van Gogh. I have this picture hanging on the wall of my office which I look at often…usually while retouching photographs I’ve taken in Photoshop. Your explanation is broken down t be easy to understand. I also love the example you chos of Monet’s work. Thank you so much! You have a great eye and an amazing ability to teach.